What would we do without bread ? 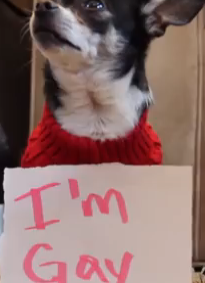 I am so happy to see it is having a revival after years of vilification . From picking absently at the bread basket on your table to judging a restaurant by its bread ……it never fails. If you get served a bunch of pale industrial chewy nondescript generic baguette slices, then I advice you to run away! Any restaurant that these days has the nerve or laziness to serve bad bread does not deserve your custom. There has been a sort of bread panic these past couple of years, mainly because of people trying to go gluten free, for diet and or health reasons. I confess to buying the scary best- seller book called Wheat Belly by William Davis where he exposes the harmful effects of what is actually a product of genetic tinkering and agribusiness being sold to the American public as “wheat.” This “wheat” is a bastardized, corrupt product in the hands of genetic modification and has nothing to do with the strains of wheat used in the past . This new wheat rises faster,whiter and fluffier and makes for great pastries but also gives us diabetes and makes us very sick with food allergies amongst other things. It also makes us fat. But if you go beyond industrial bread to the real deal , to bread made with only 4 ingredients: GOOD wheat flour (sometimes containing 6 types of flour ) plus water , yeast and salt and NO ADDITIVES, to bread that ferments for longer hours ( 68 hours in some cases ! ) to a dough that is kneaded longer and baked at low temperatures for a long time , then you get BREAD , an intense and firm chewy tangy bread with a dark crust or a crispy baguette “tradition” with a grey- looking doughy inside. Now you are talking ! 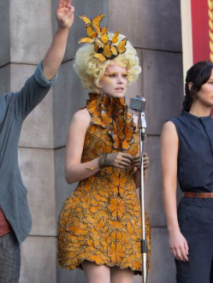 Good artisanal bread is so popular now that The New York Times did a special Bread Issue last month. Here is one of the very interesting articles . Like I did in my earlier post Coffee, I have selected some breads and looked at why they are better than others….or why they are also different. To begin with in Andalucia I like the pan cateto or pan de pueblo , which translates to “provincial bread ” or village bread. 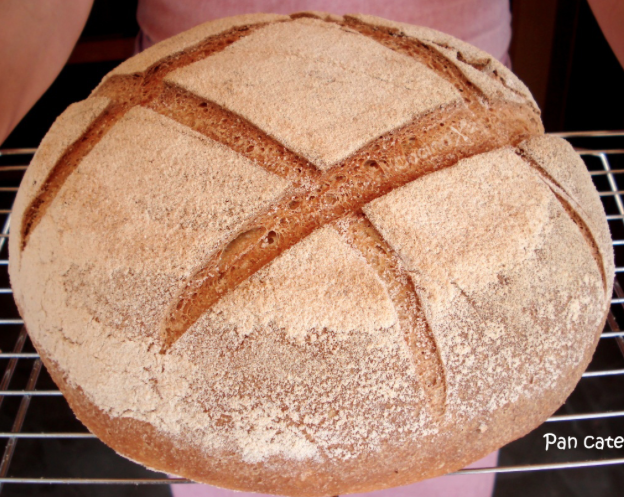 It is a big and very heavy loaf made with grano duro flour or hard grain flour, in spanish it is harina panadera recia, which comes from a variety of wheat called Durum , which in Latin means hard. Durum wheat is the hardest of all wheats and is used extensively in breadmaking. However, it is unusual in that, despite very high protein content, it is low in desirable gluten needed to form a glutinous web necessary for bread to rise. When durum flour is used as the sole flour in bread, substantial additions of isolated wheat gluten are necessary to effect rising. Without it, 100 percent durum wheat breads are often heavy, with very close grain, and will split easily when risen for baking. Durum flour is used in Italy to make pasta, it is also used in North Africa and the Middle East to make couscous, semolina, tabbuleh and bulgur. When you buy pasta always make sure it is “di grano duro.” Normal white wheat makes soft soggy pasta that is high in gluten . If you want to eat pasta and keep your glycemic index down then make sure that the pasta is not only de grano duro but you also cook it al dente . Italians are not fat and they eat pasta every day. All Italian pasta is made with durum wheat. 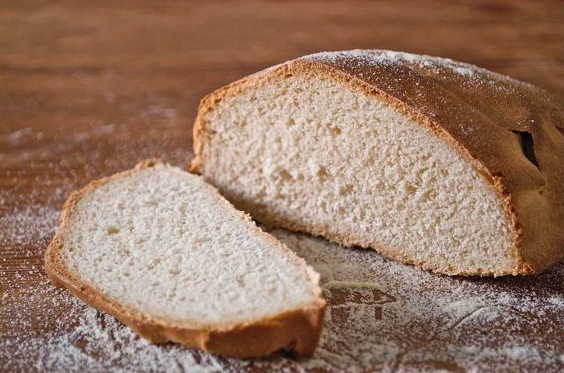 When you have been raised on cateto bread , it is difficult to lower your standards and go for other types of breads because in my opinion nothing beats a cateto bread loaf . It is coarse, it is rustic , it has a lot of personality but it is also very satisfying and wholesome. 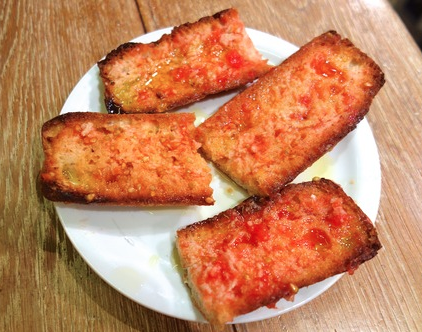 In Spain we use the cateto or any good bread for breakfast with tomato, this is called pan con tomate and you get it at every bar. 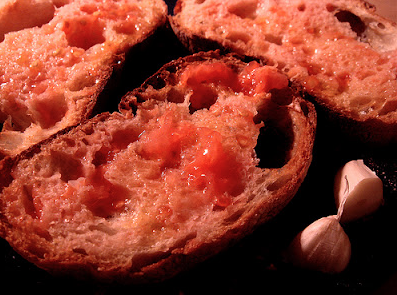 Basically you get a good ripe tomato , you grate it with a big hand grater till you get the pulp, you toast a big slab of bread , spread the tomato pulp on top and then add a little trickle of olive oil and some salt flakes. This is a great breakfast or snack that you find in most bars across the country. You can also get a whole garlic head to rub on the bread if you feel like it . I am also crazy for mollete bread but that very blanched flour makes me nervous. 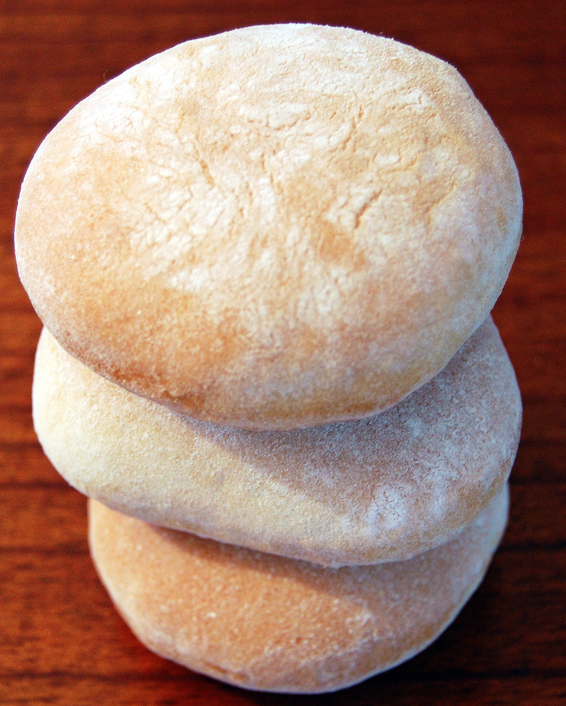 This is what wikipedia says: A mollete is a kind of bread roll from the Andalusia region, in southern Spain. 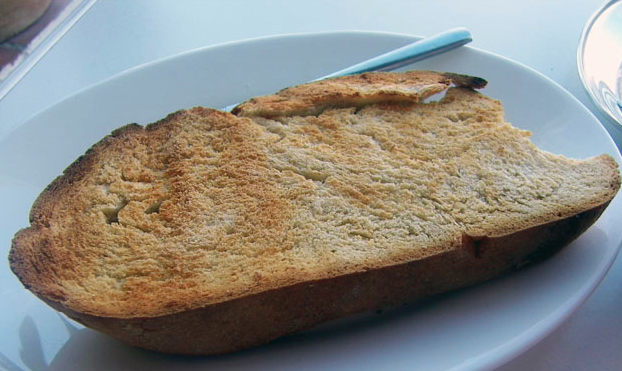 It is a soft round white bread, usually served lightly toasted with olive oil and raw garlic or spread with lard (usually in the forms of manteca colorá or zurrapa de lomo) in an Andalusian breakfast. 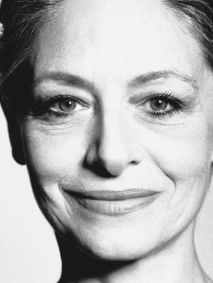 The most famous are the ones from Antequera, Malaga . 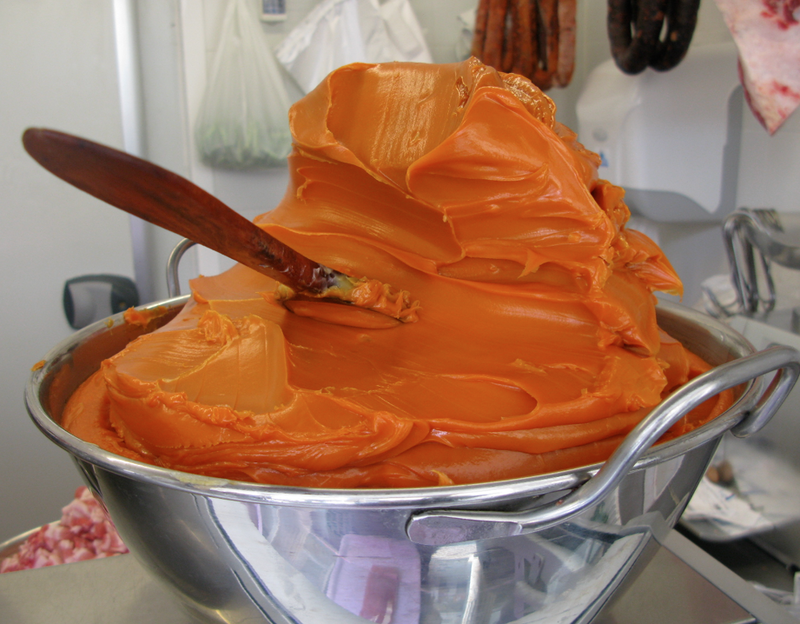 Some pig’s lard at the market . 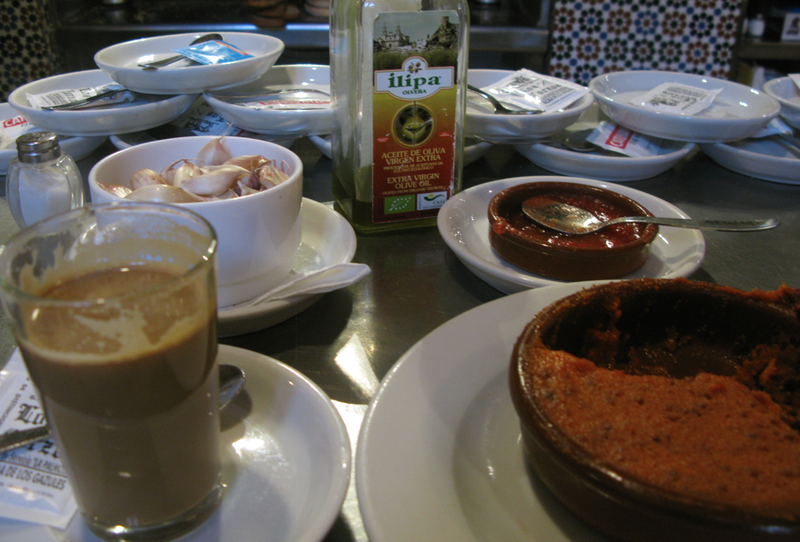 In Andalucia we use it as you would use Nutella or butter : we spread it on bread. 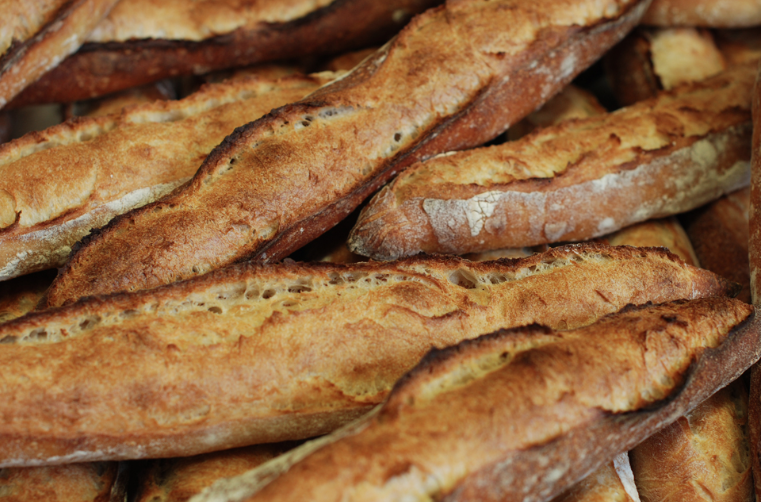 In France when choosing bread I always go for baguette tradition. Again, it is all a question of using the best flour, water, salt and yeast, no additives, a longer kneading and fermentation time and the resulting interior of the loaf, the “mie“, is not pure white but slightly grey and a bit tangy and chewy. 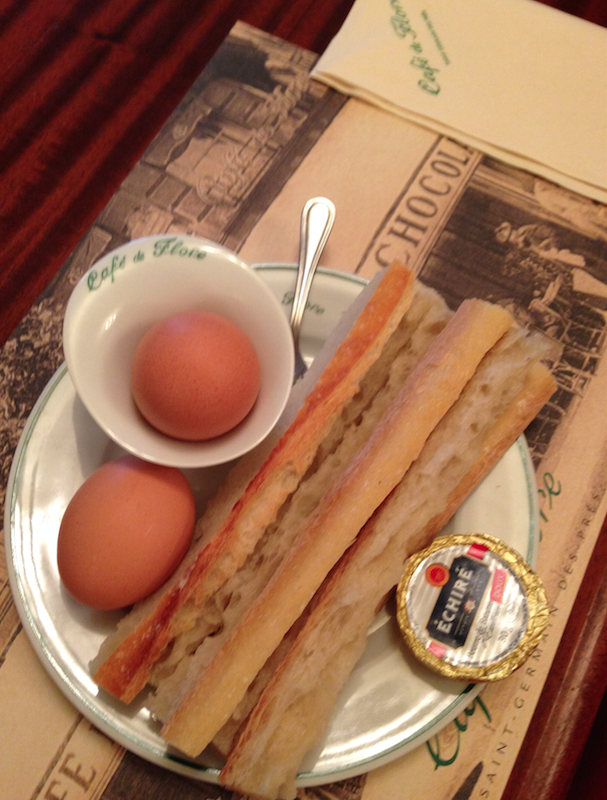 I go nuts at the Cafe De Flore with the baguette tradition they serve cut into little soldiers to dip into the oeufs á la coq , with a side of the best butter that money can buy : beurre Echiré. The bread is so good that you do not want to toast it . Thank you Francis Broussard for taking care of us for the past 35 years and making the Cafe De Flore a place where there is no wifi and soft boiled eggs come with their little pre-cut soldiers : this one is for you ! and for my friend Florence Maeght from Le Rideau De Paris who just dashed out to take this picture this evening , even if she does not eat eggs. Living in Tuscany a way back I really appreciated the way they used stale bread and made it into healthy salads and soups i.e. panzanella ( stale bread, cucumber, tomato and onion salad with oil and vinegar, cold in the summer) and ribollita (white beans , stale bread and many vegetables, very hot in the winter.) The Middle East equivalent of the panzanella is called fattouch, which is a salad with stale pieces of pita bread and sumac spice mixed in, I make it a lot because I have an excellent middle eastern supermarket nearby where I buy the fresh pita , sumac and small seedless persian cucumbers. The Andalusian version of panzanella is this refrito de esparragos, or refried green wild asparagus, with eggs and lots of garlic which I ate recently at a venta in Alcalá De Los Gazules. 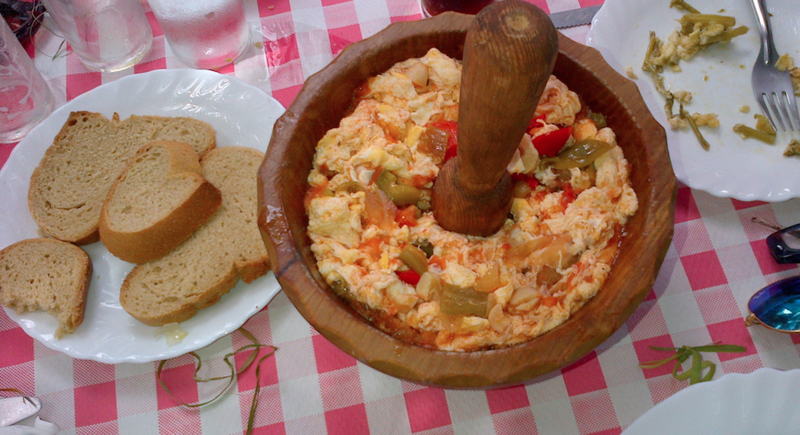 Made from stale pan cateto and served in its mortar with a pestle . In Northern California people are now obsessed with bread because California cooking is all about healthy and non-transformative cuisine using the best ingredients and therefore having such a vast array of great vegetables , salads and herbs it is only normal that bread becomes the best enhancer and at times a meal in its own . I am very luck to have an excellent baker at the farmer’s market near me in Danville (California ) on the East Bay near San Francisco . I do not have a photo of the stand but will get it next week . 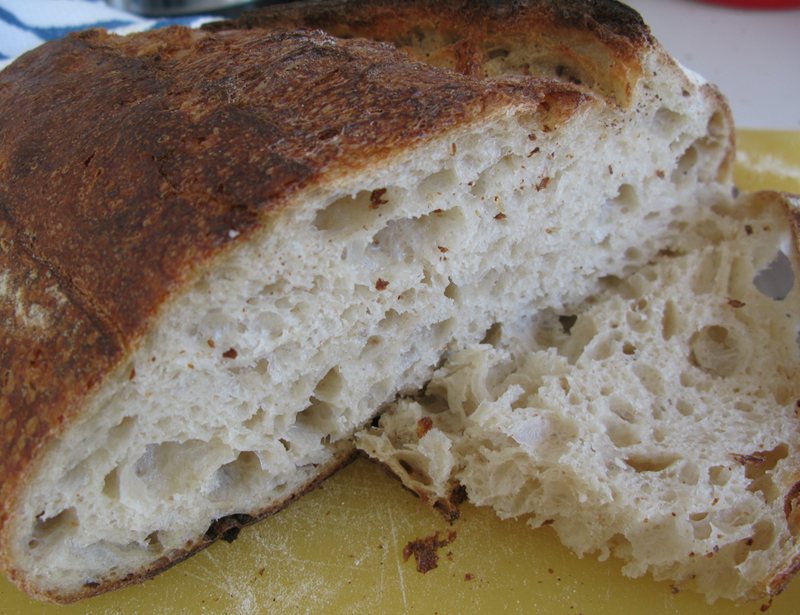 In the meantime here is their famous pain de campagne loaf which is very tangy and chewy . 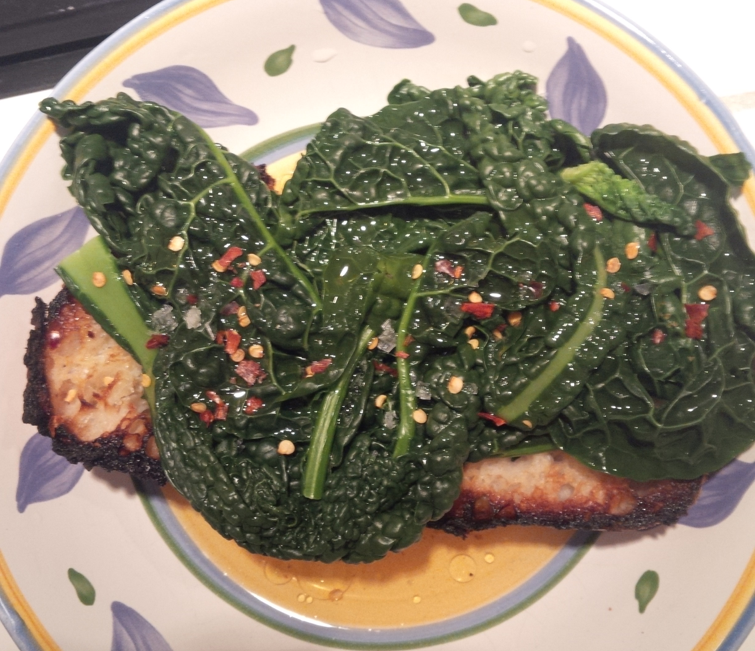 Apart from just devouring it over the course of 2 days as a main course with nothing else on it but a bit of olive oil on it , I also like to toast it and serve it tuscan style with some blanched dinosaur kale and chili flakes , Maldon salt and a trickle of strong olive oil . If you do this make sure you pour some of the cooking water on top. Italy taught me the crostino culture and they really do turn a good slice of bread into a meal. Basically toast a thick slab of sourdough bread and pile blanched vegetables or roasted tomatoes on top , salt flakes, olive oil and chili flakes and with or without prosciuto . Or take a thick slab of bread , put on top of it 2 slices of tomato , a sliver of prosciuto , a dash of olive oil and black pepper and grill it under the oven broiler for 5 minutes. And last but not least : the best baker in America is now in San Francisco. 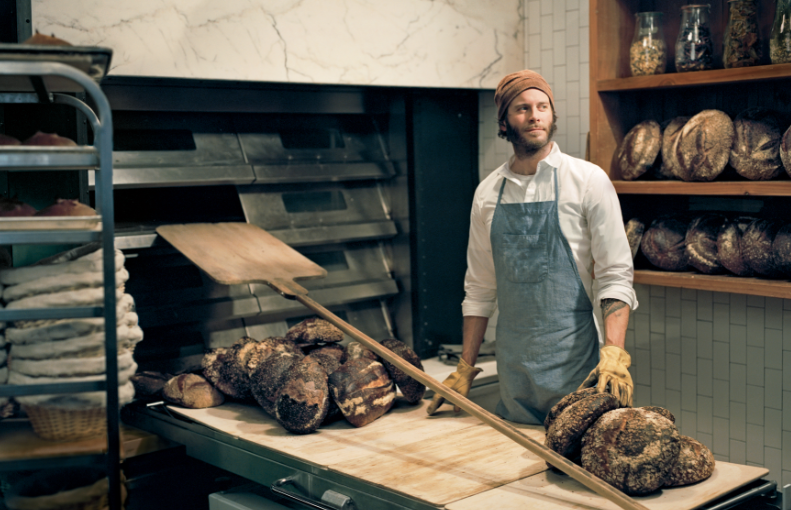 Chad Robertson of Tartine bakes only 240 loaves every day and they are sold out in an hour. 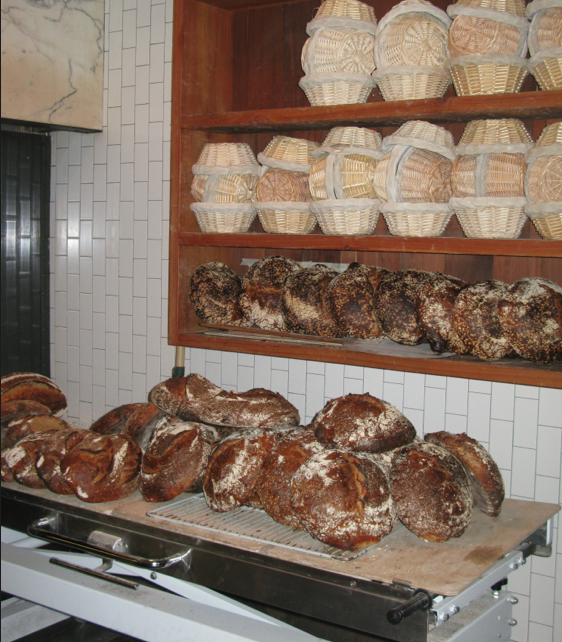 If you go to Tartine Bakery on Guerrero and 18 th street you will see a long line waiting to buy bread , as well as the fantastic croissants , cookies and morning buns, so best go to his small restaurant around the corner on 561 Valencia Street called Bar Tartine , to get your big loaf of freshly baked bread . I promise that you will never look at bread in the same way again. It’s bread as a luxury good, not because of the price but because of the craft that goes into each, and because so few are made. 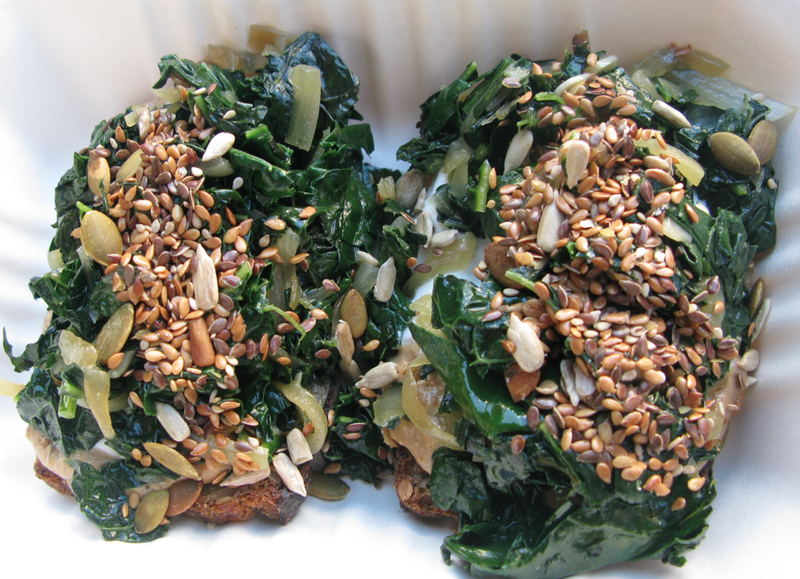 From Bar Tartine in San Francisco , their spinach and sesame crostini on their famous pain de campagne.